I’ve owned a french press coffee maker for years. The first one I got was somewhere in 2008 but I only become a truly avid french press user since the Spring of 2013. During my limited time using french presses in those early years I came to know a few things very well. I know that a good press pot will filter out as much mud as possible from your cup and it will be easy to clean. The better coffee presses are also insulated so that they brew at a more consistent temperature. This is an even more pronounced effect the smaller your carafe gets. Single serving french presses lose heat much faster than large 52-oz carafes so keep that in mind while shopping. I’ve also found that the best press pots use a lot less plastic than their peers. Also their glass is better quality and protected from breakage. And on a personal preferences note, I also have found thermal insulated french press pots to be far more appealing than their non-insulated and cheaper brethren. When I started using a french press I really only though they were all the same but in this short amount of time I’ve come to appreciate differences in style and function. As such I’ve sorted this page into more focused groups for easier browsing, categorization, and shopping. 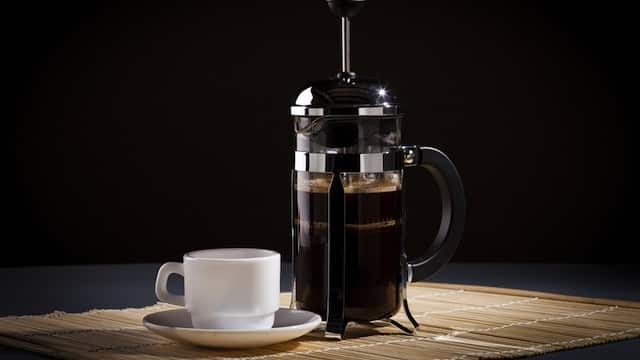 As this site develops this page will likely expand to cover more types of french press coffee makers but in the mean time see the following pages for my lists of top french press coffee makers for sale today. See the following pages to narrow down what you’re looking for. This page features mainly coffee press pots that are 12 cups in size (~50-51 oz). Most pots this size are still affordable but they can get pricey if you look for stainless steel construction and double walled insulation. For me these are great to have but so long as you own a quality thermal carafe you don’t need to pay up for insulation. Also, the fancier models tend to cost more but aren’t necessarily better at making coffee. Unlike large press pots a small coffeemaker is far easier to take camping or traveling. These units can typically be found for less meaning there is less financial loss if they are left behind or broken while out of the house. They also make small batches of coffee around the house a lot simpler too. 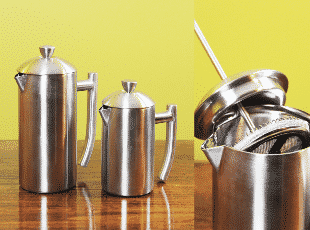 If you like french press coffee and travel a lot then you need to get a press pot travel mug. They are super convenient and come in many different styles. Here are some of my favorites. If you like to drink more coffee than a cup or two at a time and are considering buying a french press then make sure to spend the extra bit on an insulated model so that cups 2-4 stay hot while they wait for you to get to them. Here are some of the better press pots on the market in both stainless steel and glass. 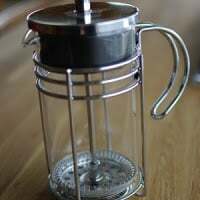 Cheap French Press Pots – For many people it simply doesn’t make sense to spend a lot of money on a french press. Campers for instance just need the most basic non-breakable option. Occasional coffee drinkers also shouldn’t spend a fortune either because they won’t use them regularly. Same goes for people buying a second size press that won’t get used very often. There are lots of inexpensive coffee presses and some are better values than others. In this post I’ll help steer you towards the best value. French Press Pots for Camping – As you well know making coffee while camping can be a lot different than doing it in the kitchen. Quality usually takes a backseat to convenience, durability, and size. 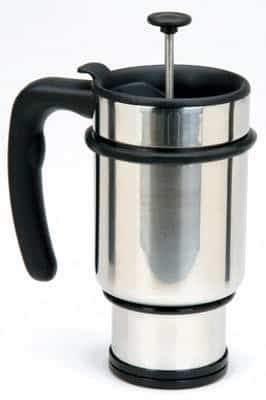 On this page I’ve tried to find and feature only the best coffee presses for campers of all types. 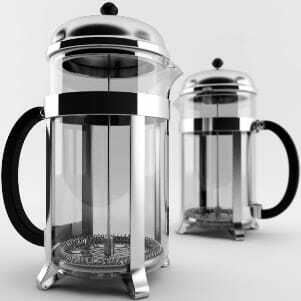 French Presses With Dual Filters – If you love the taste of clean unfiltered coffee then you have to try brewing with a coffee press that utilizes a double filtration plunger. There are some really fancy plungers out there these days that do better than ever before at removing the majority of all grind sediment from your batch. You pay up for this but the final product is so much cleaner than you typically get from a normal french press. It’s worth it for lots of people IMO. You can also see our store for traditional coffee makers as well.